FWQA has been very proud to provide scholarships to students seeking careers in wastewater and related field. In the past, FWQA has provided each year, at least three $2,000 annual scholarships (based on sponsor donations) to Washington, D.C.-area high school seniors accepted to college to pursue careers in the environmental sciences. Graduating seniors from high schools in the Washington, D.C. metropolitan area planning to pursue environmental careers are eligible to apply for FWQA scholarships. Before receiving the awards, recipients must be accepted into a four-year bachelor's program in an acceptable field of study by an accredited institution of higher learning. Examples of acceptable fields of study include: chemistry, biology, environmental sciences, environmental engineering, civil engineering, chemical engineering, and natural resources planning. Mr. Richard (Rich) Barber served as FWQA's president in 1992-1993 and was instrumental in establishing FWQA's first student chapter, at Howard University. Mr. Barber received his B.S. in Civil Engineering from Temple University and his M.S. in Environmental Science from Rutgers University. His distinguished career included 17 years as an environmental engineer with the U.S. Environmental Protection Agency. 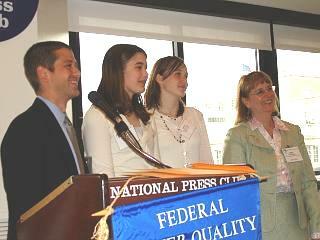 This scholarship honors Mr. Barber's hard work and dedication on behalf of EPA and FWQA. He died in 1996 after a two year battle with cancer. Dr. Gordon McCallum served in the Commissioned Corps of the U.S. Public Health Service for 26 years, retiring in 1965 with the rank of Assistant Surgeon General. He served as administrator of the Federal Water Pollution Control Program from 1955 to 1965. A former FWQA president and Water Environmental Federation board member, Dr. McCallum is memorialized through this scholarship. Dr. Harvey Olem was a respected colleague whose plane disappeared in Bolivia in May 1994 while he was working on a World Bank project. Dr. Olem began his career as an environmental engineer with the Tennessee Valley Authority and later worked as a project manager for the U.S. Environmental Protection Agency. He was founder and president of Olem Associates and the Center for Watershed Protection. Dr. Olem was a frequent author and respected consultant in the water quality field. He served as an active member of FWQA, and his memory is honored through this scholarship.